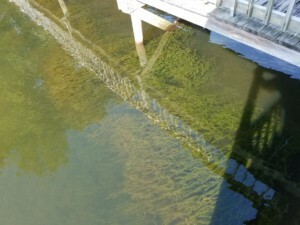 For the past decade, grass carp have kept hydrilla in check after its explosive growth throughout the Catawba River basin’s lakes. However, the grass carp are sterile and must be restocked. On Lake Norman, that had fallen behind, and over the past year, hydrilla has returned. 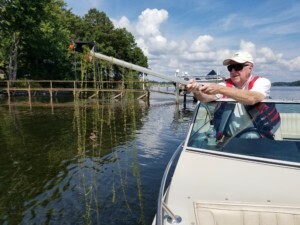 Hydrilla’s growth in Lake Norman has been especially concentrated in the Mecklenburg area. We have received a lot of complaints this summer as warm weather and sunlight — combined with a build-up of nutrients — have fueled overwhelming growth that has filled out the water column in many areas. This has been especially true as in recent weeks with less precipitation, water has cleared up and allowed for more growth. More grass carp will be stocked this spring. 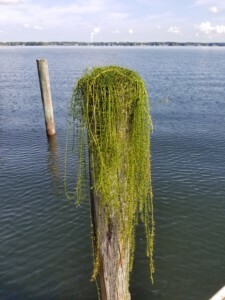 Hydrilla is an invasive species and can grow one inch per day; stems can reach 30 feet long. Because it’s growth is so thick and rampant, it can quickly cause issues for any sort of intakes, from jet skis to HVAC units on boats to other pipes siphoning water from the lake. Avoid chopping it up; this promotes its spread. Do NOT spread your own herbicide! NC DEQ and the Lake Norman Marine Commission will coordinate efforts and try to determine safe options. Do NOT over-apply fertilizer on your property — this fuels a lot of growth you do NOT want in the water!